According to the San Diego County District Attorney’s office, retired mixed martial artist, Chris “The Crippler” Leben faces 16 criminal counts, including one felony count possession of an assault weapon and 11 counts of disobeying a court order. The charges stem from a June 8 incident in which Leben allegedly broke into ex-wife’s apartment in downtown San Diego. Police were called to the scene and found a loaded .45 caliber pistol on her bed. A restraining order filed by Kaleena Leben, unsealed by a judge and obtained by NBC San Diego, alleged the fighter woke her up at 3 a.m. by banging on the door. A short time later, she alleged he tried to scale a wall of the apartment building to gain access by the balcony, and she fled the apartment and took refuge with a neighbor. He was arraigned on July 23 and is due in court August 3. A preliminary hearing on Aug. 5 will determine whether there’s enough evidence to move forward on his case. Tanya Sierra, public affairs officer for the district attorney, said Leben could face a maximum of 16 years and eight months in prison if convicted on all charges. Including only the felony charges, however, he faces three years and eight months, “a much more representative number of his true maximum,” she said. One day prior to the incident, Kaleena Leben wrote in her petition, the ex-fighter sent a text threatening her father’s life. She said an M16 assault rifle was found by the building’s management. Leben told NBC the gun belonged to his estranged wife. Speaking to NBC, the estranged couple hurled accusations at each other. Chris Leben claimed she beat him and was emotionally abusive while she said he abused her repeatedly. Kaleena Leben accused her estranged husband of being mentally ill and addicted to several drugs, including opiates and steroids. She said she was taken to the emergency room in 2011 after he pushed her into a wall; Chris Leben denied using drugs and said she was drunk and high and injured herself during the incident. 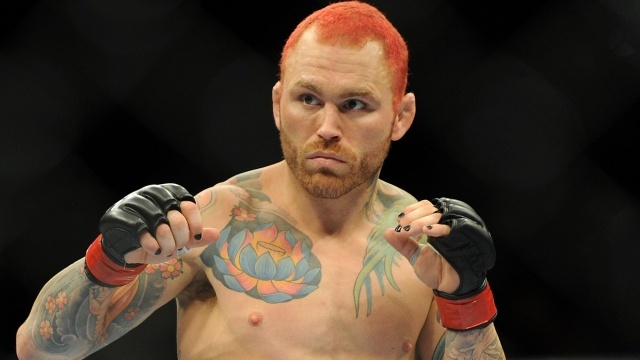 According to the report, Chris Leben was arrested earlier this month during his 35th birthday celebration.